The opposition mayor of Venezuela’s capital city of Caracas has been indicted for what the government says his involvement in a US-funded coup plot against the government of President Nicolas Maduro. The attorney general’s office said on Friday that Antonio Ledezma (pic above) had been indicted for conspiracy and would remain in the Ramo Verde military prison pending his trial. Ledezma was apprehended on Thursday from his office in Caracas on charges of involvement in a coup attempt financed by the United States. 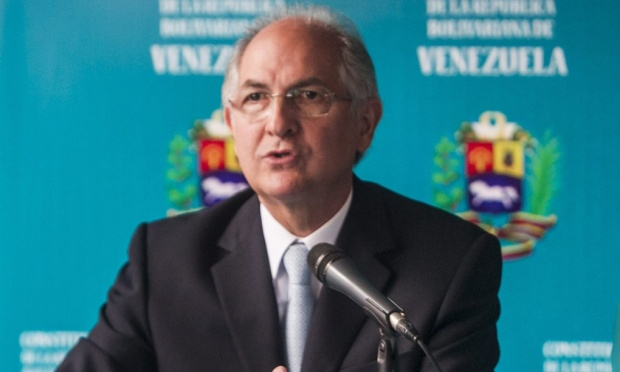 Opponents, however, have called on Maduro’s administration to provide evidence of the plot charges against Ledezma, who has served as Caracas mayor since 2008. The arrest came one week after, Ledezma’s name appeared on a list containing those accused of plotting a coup to overthrow the country’s socialist government. US denies backing coup plot. The arrest of the Caracas mayor prompted Washington to raise concerns on Friday over the tensions in Venezuela. “The Treasury Department and the State Department are closely monitoring this situation and are considering tools that may be available that can better steer the Venezuelan government in the direction that they believe they should be headed,” said White House spokesman, Josh Earnest. Caracas has repeatedly stated that the opposition seeks to launch a coup d’état in the South American country with the backing of Washington. Maduro said last December that he had “recordings” that reveal the US was seeking to corrupt Venezuelan government officials. The remarks came amid last year’s anti-government street protests in the Latin American country that resulted in more than 40 deaths. On December 3, 2014, Venezuelan opposition leader Maria Corina Machado was also charged with being involved in an alleged conspiracy to assassinate Maduro, an allegation which she strongly denied. Caracas and Washington remain at odds since late Hugo Chavez became Venezuelan president in 1999. Both sides have refused to exchange ambassadors since 2010. The countries have chargé d’affaires running their respective embassies.